Throughout history, the sea was a dangerous place, and in many ways it still is. No matter how skilled a crew or stout a ship, alone it was often perilously prone to misfortune, whether by the elements or other seafarers. When a voyage held a lot at stake, instead of traveling alone, the safest bet to complete a task was to travel in an armada. An armada usually means a group of military vessels that traverse the seas as a single unit. 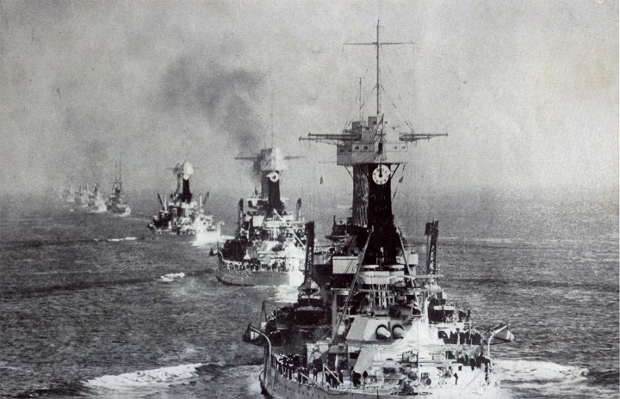 Historically, and still predominantly, armada has a close association with ships and military activity. However, it has since been loosened not only to mean a group of ships but any set of vehicles, or even inanimate objects or animals, in general. For instance, a group of parents shuttling their kids en masse from their soccer game to the pizza party afterward would constitute an armada just as much as a fleet of warships. The key sense that armada conveys is not just the abundance of the participants but the cohesion between them to form one unified force. Just like a nation is a single, encompassing group of people bound by a common purpose, so is an armada a singular, interdependent collection of moving objects with a shared mission. Additionally, it also implies a unit that is particularly large, powerful, or intimidating. A fleet is impressive, but an armada is truly formidable. Example: New Yorkers crowded the docks during Fleet Week to see the American armada arrive. Example: The visiting dignitary arrived to the embassy in an armada of black SUVs. The English use of the word armada as we know it today began in the late-16th century, appropriated wholesale from the mid-16th century Spanish word for "an armed force." Prior to this, it took the form of the Medieval Latin word of the same meaning, "armata," which was the feminine past participle of the Latin "armare," meaning "to arm." This giant fleet of American warships - a modern armada - churns across the ocean day and night for a journey of four thousand miles. It moves with the inevitability of a railroad schedule. It stops for nothing, it deviates for nothing. Bradley leans on armada's reference to an especially imposing fleet when he uses it to describe the American naval unit as it sails the world's oceans. If a fleet is an armada, it is very well-armed. Bring out the linguist in you! What is your own interpretation of armada. Did you use armada in a game? Provide an example sentence or a literary quote.